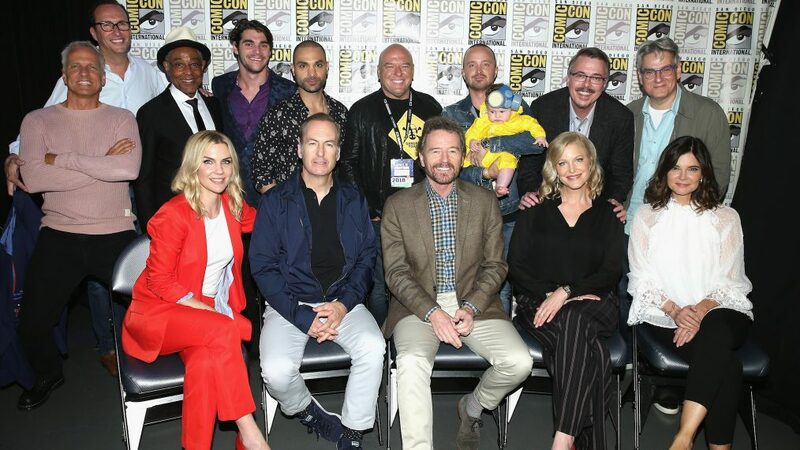 The Season 4 premiere of Better Call Saul was a long time coming as fans of the show waited over a year since Season 3 wrapped to return to the world first introduced in Breaking Bad. Many familiar faces were included in the premiere episode, as well as fan favorite baddie Gus Fring (Giancarlo Esposito), who joined the cast last year in Season 3. Fans were also offered another glimpse into Jimmy's (Bob Odenkirk) life as Gene Takavic living in Nebraska. From Chuck's (Michael McKean) [Spoiler] death to Mike's (Jonathan Banks) security breach, there was plenty for fans of both Bad and Saul to enjoy. Read on for five important moments from this first episode. As with every season of Better Call Saul, the episode opens up with Jimmy/Saul living under his alias of Gene Takavic — one given to him at the end of Breaking Bad. Fans last saw Gene passed out on the floor of the Cinnabon franchise at which he works. But in this continuation of the present/future timeline, he is released after a hospital visit. Yet it was the cab ride home that was most distressing, as Jimmy notices an Albuquerque car ornament swinging from the rear-view mirror. As he exchanges suspicious glances with the driver, viewers suddenly realize that Gene isn't an infallible disguise — anyone from ABQ would recognize the former lawyer who once saturated the air waves with his promotions and commercials. Everyone who watched Breaking Bad already knows that Mike is an expert when it comes to being discreet, but fans are offered a glimpse at the beginnings of his work with Madrigal — the company that fronts Lydia's dealings — and how he manages to lay low despite being seen. As he steals one worker's ID card and runs wild in the company's warehouse, we're reminded of his days on Breaking Bad. After Chuck's funeral, Howard (Patrick Fabian) shows up at Jimmy and Kim's (Rhea Seehorn) apartment to discuss Chuck. In a moment of vulnerability and honesty, Howard shares his theory that Chuck killed himself and he's to blame. As he explains that he bought Chuck out of the company because of an insurance issue, Jimmy's made aware that his dealings with the insurance company caused the issue, unbeknownst to Howard. This is the first time viewers have seen Howard so torn-up about anything, and it implies that we'll see more of this side as he continues to grieve. It's fairly easy to say that Chuck's death wasn't a shock — after ripping up his entire house with the insulation and dry materials, a fire would burn rather quickly — but Jimmy's reaction certainly os. The brothers didn't always see eye-to-eye or get along, but Jimmy's initial reaction is to be expected. He seems to grieve taking long bouts of silence and contemplation. Yet it's during Howard's visit that a switch seems to turn for Jimmy. When he confesses he felt guilty for Chuck's death, Jimmy says, "Well Howard, I guess that's your cross to bear." And then immediately, he offers Kim and Howard coffee as if it's a regular day. Picking up where Season 3 left off, we join Gus and Nacho (Michael Mando) in an abandoned lot as Hector Salamanca (Mark Margolis) is carted into an ambulance. When the two are left alone, Gus steps aside to make a call, and Nacho attempts to discard the pills he'd messed with in Season 3. Eventually, after dealing with Gus and his associate, Nacho is left with a warning that Salamanca territory will not change despite Hector's condition. As he drives away and gets rid of the evidence, which would link him to Hector's bout of illness, one of Gus' men well-known to Breaking Bad fans is watching. What will it mean for Nacho moving forward? Hopefully viewers will have more insight as the season carries on.